Many of the mechanics in Guard 'N' Hose serve mutlpile purposes. -The player's jump can be used to get above enemies, and then held to spray them with water. -This water spray can be used to damage enemies and to clear dangerous slime from the ground, to create a safe place to land. -This also lets the player hover, allowing for more dexterous aerial maneuvers. -It can be used to bounce on round enemies to get above tall enemies, and regain some water while in the air. -...And when landing, the player performs a Splash attack that damages all nearby enemies, as well as refilling all of the player's water. 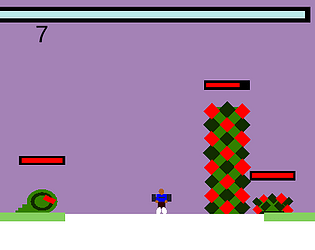 I also took care to design orthogonal enemies as well, that encourage specific types of play. I do regret how similar my concept ended up becoming to Downwell, though I believe it occupies a more defensive style of gameplay as opposed to the Downwell's combo-chasing offense. I used the Unity Engine to create this game. And I used a song from Incompetech.com which is properly licensed in Guard 'N' Hose's title screen and the Contributors section below. This game is great, the pun is great, even though i'm not a fan of the art, it still clearly communicates you can't land on the spiky enemies, because they're spiky.